Transportation Commissioner Steve Novick celebrates the first Fixing Our Streets groundbreaking at SE 104th and Bush. Photo by Cevero Gonzalez, Portland Bureau of Transportation. 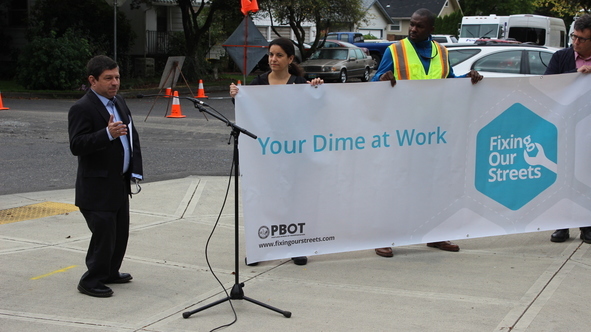 (September 19, 2016) Commissioner Steve Novick and Portland Bureau of Transportation (PBOT) Director Leah Treat celebrated the first groundbreaking of the Fixing Our Streets program today at a base repair project at the intersection of SE 104th and Bush. 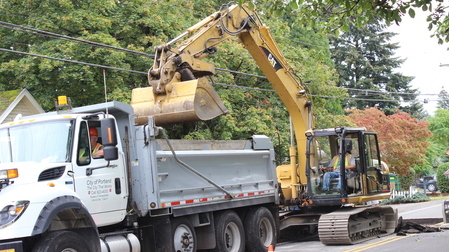 The Fixing Our Streets program is the result of the passage of Measure 26-173, a ten cent tax on motor vehicle fuels and Portland’s first local funding source dedicated to street repair and traffic safety projects. Passed on May 17th, 2016, Measure 26-173 will raise an estimated $64 million over four years. $8.6 million of the Fixing Our Streets funding will go towards base repair projects, as per the project list that was passed by Portlanders. In May, the Portland City Council also unanimously passed a Heavy Vehicle Use Tax. This separate tax for vehicles weighing more than 26,000 pounds will also fund the Fixing Our Streets program. Fixing Our Streets includes paving, base repair, sidewalks, crossings, neighborhood greenways, safe routes to school, high crash corridors, protected bike lanes and alternative street design projects that will all have a significant impact on neighborhoods across Portland. An interactive map of Fixing Our Streets projects can be viewed atmap.fixingourstreets.com. Base repair projects fix those portions of a street that have failed from top to bottom. The goal of these base repair projects is to prevent the structural failure from spreading to other parts of the street. Thanks to Fixing Our Streets, PBOT will be able to increase the amount of base repair projects it does each year. The project at SE 104th and Bush is a high volume street one block south of Powell Boulevard, adjacent to Ed Benedict Park and the Portland Memory Garden and only a few blocks from Earl Boyles Elementary School. In addition, Fixing Our Streets will allow PBOT to complete 12 major paving projects over the four years of the program. These projects add up to approximately 30 miles of streets that will be restored to very good condition. PBOT has negotiated an intergovernmental agreement with the Oregon Department of Transportation to collect the fuels tax on behalf of the City of Portland. Fuels tax collection will begin no later than January 1, 2017. With budget authority from City Council, PBOT has already begun to work on small, but vital projects like the base repair project at SE 104th and Bush. The bureau is also working on the initial design work for the larger paving projects that are set to start next spring and summer. Program details can be found at www.fixingourstreets.com.